Not to be confused with the 2019 State of the Union Address. 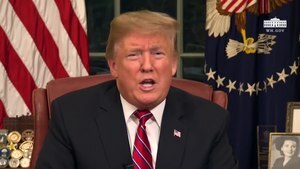 On January 8, 2019, the 17th day of a partial shutdown of the United States federal government, President Donald Trump delivered an address on illegal immigration from the Oval Office of the White House in Washington, D.C. Major television networks broadcast the president's speech as well as the Democratic response. Trump used the speech to push for Congress to fund the construction of a larger barrier or wall at the border with Mexico, in order to fulfill a key promise of his campaign. Trump's refusal to sign a continuing resolution to keep the federal government open in the absence of funding for the wall had led to the shutdown. The address lasted just under ten minutes and was Trump's first to be televised from the Oval Office. During the speech, Trump blamed the shutdown on Congressional Democrats, despite saying in a televised meeting held with Democratic leaders Nancy Pelosi and Chuck Schumer on December 11 that he would be "proud to shut down the government for border security" and that he would not blame the Democrats. Trump reiterated his demand for $5.7 billion for the border wall, which he said would be made of "steel slats" instead of concrete, as previously assumed. He cited statistics he claimed were caused by illegal immigration to the United States, such as the opioid epidemic: “Every week, 300 of our citizens are killed by heroin alone, 90 percent of which floods across our southern border”, and high crime rates among illegal immigrants: “In the last two years, ICE officers made 266,000 arrests of aliens with criminal records,” Trump also said that "Senator Chuck Schumer, who you will be hearing from later tonight, has repeatedly supported a physical barrier in the past, along with other Democrats." and: "America proudly welcomes millions of lawful immigrants who enrich our society and contribute to our nation, but all Americans are hurt by uncontrolled illegal migration. It strains public resources and drives down jobs and wages." Trump further said, "The border wall would very quickly pay for itself." All of these claims are accurate, according to The New York Times fact checkers, but reportedly needed context. They also said his claims, “The federal government remains shut down for one reason and one reason only: because Democrats will not fund border security,” and that, “The wall will also be paid for, indirectly by the great new trade deal we have made with Mexico,” are "false" because Democrats did not support the wall, but border security in general, and that Mexico paying indirectly was "different" from Trump's campaign promise that Mexico would pay for the wall. They also wrote that his claim that, “Every day, Customs and Border Patrol agents encounter thousands of illegal immigrants trying to enter our country,” was "misleading". Leaders of the Democratic Party requested equal airtime. House Speaker Nancy Pelosi and Senate Minority Leader Chuck Schumer delivered a response to Trump's speech, blaming Trump for the shutdown, saying "his obsession with forcing American taxpayers to waste billions of dollars on an expensive and ineffective wall — a wall he always promised Mexico would pay for." The New York Times has determined Schumer's statement that "[no] president should pound the table and demand he gets his way or else the government shuts down, hurting millions of Americans who are treated as leverage." needed context but was true, indirectly through Americans' family members. Trump's administration requested airtime from the networks one day in advance. Trump then announced via Twitter: "I am pleased to inform you that I will Address the Nation on the Humanitarian and National Security crisis on our Southern Border. Tuesday night at 9:00 P.M. Eastern". The speech was carried live by the major over-the-air and cable news networks in the U.S., eliciting criticism that the media was giving the president a free platform to possibly make "inflammatory or misleading statements". Critics compared the favorable treatment of Trump by the media to the refusal of networks to air a November 2014 speech on immigration by President Barack Obama for being "too political". Prior to the speech, Joe Lockhart, Daniel Pfeiffer, Jay Rosen, and Connie Schultz, among others, advocated for media to fact check Trump's comments. Mika Brzezinski said networks "should refuse to turn over the airwaves to Donald Trump tonight for what they know objectively to be a steady stream of lies". Ted Koppel said Trump should be given the "benefit of the doubt". The address and Democratic response drew an estimated total of 43.3 million viewers not including livestreams according to a Nielsen report. The address brought in a 28.1 rating and the response brought in a 29.3 rating in metered markets on ABC, CBS, NBC, Fox, Fox News, CNN and MSNBC. A Trump Pence campaign fundraising email titled “Official Secure the Border Fund” was distributed prior to the speech and asked supporters to donate. A second fundraising plea to Trump supporters followed the speech and gave supporters additional time to get on the list. ^ Smith, Allan (January 8, 2019). "Major networks will carry Democratic response to Trump immigration speech". NBC News. Retrieved January 8, 2019. ^ Stelter, Brian; Darcy, Oliver (January 7, 2019). "Networks set to air Trump's prime time address; Pelosi, Schumer demand equal time". CNN. Retrieved January 8, 2019. ^ "Government shutdown: Trump appeals to US TV audience over wall". BBC News. January 8, 2019. Retrieved January 8, 2019. ^ Bradley, Laura (January 8, 2019). "Networks Will Air Trump's Surely Inflammatory Immigration Speech . . . Why?". Vanity Fair. Retrieved January 8, 2019. ^ a b Barr, Jeremy (January 7, 2019). "Broadcast Networks Deliberate, Then Decide to Carry Trump's Border Speech". The Hollywood Reporter. Retrieved January 8, 2019. ^ a b c d e f Stelter, Brian (January 8, 2019). "Trump's border address sparks extraordinary debate inside and outside TV networks". CNN. Retrieved January 8, 2019. ^ Burgess Everett; Sarah Ferris; Caitlin Oprysko (December 11, 2018). "Trump says he's 'proud' to shut down government during fight with Pelosi and Schumer". Politico. Archived from the original on December 24, 2018. Retrieved December 23, 2018. ^ Golshan, Tara (January 8, 2019). "Democratic leaders call for equal airtime to rebut Trump's immigration speech". Vox. Retrieved January 8, 2019. ^ "Pelosi and Schumer Will Deliver Democratic Response to Trump's Speech". The New York Times. January 8, 2019. Retrieved January 8, 2019. ^ a b Wemple, Erik (January 8, 2019). "Collusion! Networks miraculously come to same conclusion on Trump speech". The Washington Post. Retrieved January 8, 2019. ^ a b Bardella, Kurt (January 7, 2019). "News networks should not air Trump Wall speech without fact-checking first". USA Today. Retrieved January 8, 2019. ^ a b Nakamura, David (January 8, 2019). "Three presidents, three speeches — and an immigration debate that has grown coarser". The Washington Post. Retrieved January 8, 2019. ^ Nover, Scott (January 8, 2019). "There's No Winning for the Networks". The Atlantic. Retrieved January 8, 2019. ^ Yglesias, Matthew (January 7, 2019). "Networks giving Trump free airtime on Tuesday refused to air Obama's 2014 immigration speech". Vox. Retrieved January 8, 2019. ^ Stanley-Becker, Isaac (January 8, 2019). "'This president lies daily': Critics demand networks fact-check Trump's live immigration speech". The Washington Post. Retrieved January 8, 2019. ^ "43 Million People Watched Trump's Oval Office Address". Time. Retrieved 2019-01-13. ^ Cohn, Alicia (2019-01-09). "Pelosi, Schumer response tops Trump speech in preliminary ratings". TheHill. Retrieved 2019-01-13. ^ "Trump address draws big TV ratings — but also reveals partisan divide". NBC News. Retrieved 2019-01-13. ^ Alfaro, Mariana (8 January 2019). "Trump's 2020 reelection campaign is sending fundraising emails for a 'border fund' in advance of his prime-time Oval Office address". Business Insider. Retrieved 11 January 2019. ^ Poulson, Kevin (9 January 2019). "Trump's Oval Office Speech Was a Dud. But It Could Be a Fundraising Success". The Daily Beast. Retrieved 20 January 2019. Trump, Donald J. "President Donald J. Trump Calls on Congress to Secure our Borders and Protect the America People". The White House. This page was last edited on 20 April 2019, at 21:22 (UTC).